Protecting your business in the case of an emergency is incredibly important. Installing a quality fire alarm and emergency lighting system ensures that staff feel comfortable and confident in the work place. Fire safety is a necessity. The fire alarm and fire sensors that we install have a high sensitivity system which is ideal for critical situations, where traditional sensors may be inadequate. We use equipment from leading manufacturers, ensuring the most suitable installation for each type of business and usage. All fire alarms we install meet the BS 5839-1:2013 code of practice for design, installation, commissioning and maintenance of systems in non-domestic premises. Alongside the fire alarm installation, we also provide emergency lighting services to suit the needs of your business, from fire exit signs to floor lighting. 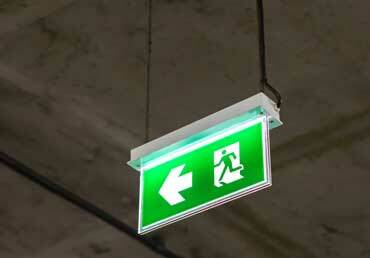 We can adapt all emergency lighting to the specific layout of your building. All emergency lighting is installed and maintained to meet the standards set of the BS EN 1838:2013 by the European Standard. Regular testing is needed to ensure that health and safety regulations are met and we offer inspection services and maintenance contracts. Our expert team are on hand throughout to design and install a fire alarm system and emergency lighting to suit your business sector and work space. Every business requires industry specific safety measures and at MCE Electrical we take a proactive approach to ensure maximum safety within your workplace.